Irvin received 51 of the 222 votes cast (23%). J.D. Hammer finished second with 43 votes (20%), Jose Taveras finished third with 22 votes (10%), McKenzie Mills fourth (16, 7%), Jhordany Mezquita fifth (15, &%), and Victor Arano sixth(13, 6%). Seventeen others received the other 62 votes. Cole Irvin was drafted by the Phillies in the 5th round of the 2016 Amateur Draft out of Oregon. After throwing 105.0 innings at Oregon in 2016, Irvin reported to Williamsport and recorded a 5-1 record with a 1.97 ERA in 45.2 innings. He walked 8 (1.6 BB/9) and struck out 37 (7.3 K/9). Irvin started in Clearwater in 2017 and posted a 4-6 record with a 2.55 ERA in 67.0 innings. He walked 14 (1.9 BB/9) and struck out 52 (7.0 K/9). He was promoted to Reading where he posted a 5-3 record with a 4.06 ERA, 24 BB (2.6 BB/9), and 66 K (7.0 K/9) in 84.1 innings. Irvin was invited to spring training this year. He’ll have an opportunity to make the big club, but will more likely start the season in Lehigh Valley’s rotation. Next up is your selection for the #28 prospect in the organization. Vince Velasquez and Tom Eshelman were the latest guys to show up in Clearwater. They joined 28 others at the Complex. Players loosened up going through their stretching routines in left field on Robin Roberts Field. 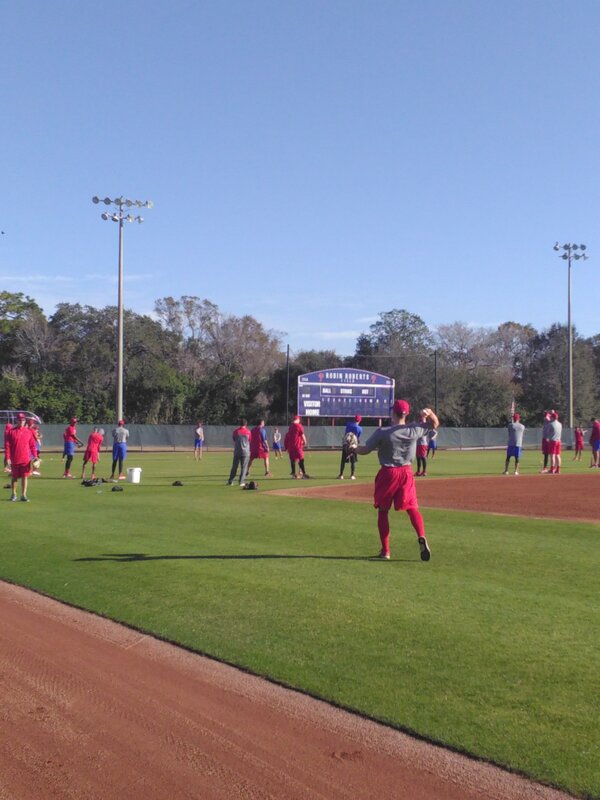 After long-tossing, they split up into two groups – pitchers on Steve Carlton Field for PFPs with Coach Ray Burris, and ground balls and fly balls for position players on Roberts. PFPs are usually boring to watch, but Coach Burris kept it interesting. ALL the pitchers took part except Mario Sanchez and Sutter McLoughlin. The group included – Velasquez, Eshelman, Morgan, Leiter, Beato, Lively, Hammer, Anderson, Thompson, Eflin, Pivetta, Ben Brown, Mills, Young, Cleavinger, McGarry, Etsell, Warren, Singer, Gowdy, and Dyer. Quinn, Cozens, Cabral, and De La Cruz shagged fly balls in the outfield, while Florimon took ground balls at third. He was joined by Moore and Walding. Cozens came in to relieve Coach Shawn Williams at first base and Quinn joined the line of players at third. Afterwards, the seven position players took BP – Quinn, Cozens, and Florimon off Coach Roly de Armas; and Cabral, Moore, Walding, and De La Cruz off Coach Williams. If I’ve anticipated their workouts correctly, the pitchers will throw again tomorrow. Of the 30 players who have arrived early, 10 are on the 40 Man Roster. 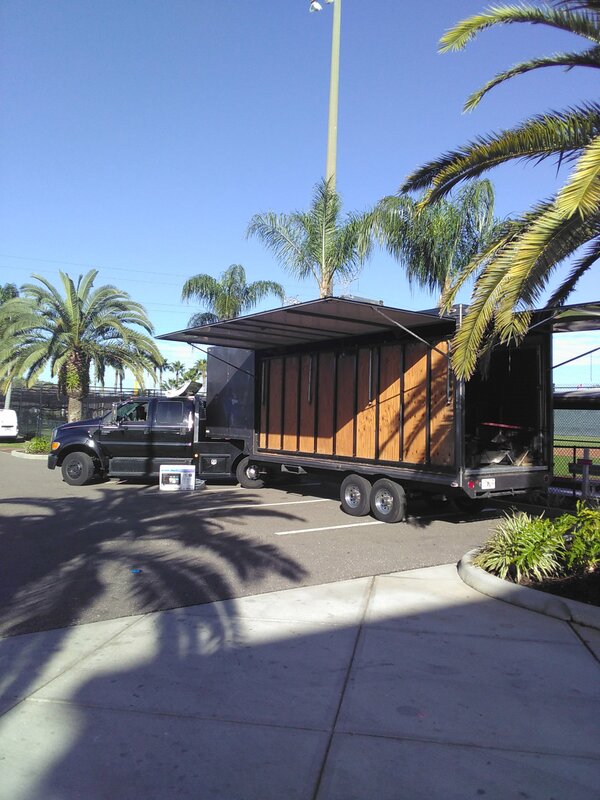 Another sign that spring training is almost here – the arrival of the merchandise truck at the Complex. Hammer seems to always be the bridesmaid and never the bride. I’m voting Mills again. Still looking for Guzman’s name, still voted for Gowdy. It’s great to hear Dyer and Gowdy are involved. Hopefully we’ll see both at some point this year. I’m also wondering if we’ll see Cozens at 1B more this year, especially considering LHV doesn’t have an everyday 1B on the team yet. I would hope Matt Klentak would move him to another team before sending him down to the minors again…he has paid his dues down there. Or at least let him become a FA after June 1st if he is sent down, so he can try to hook up with a team that may give him an opportunity to play in the majors.. But he’s a negative WAR player in his second MLB season. That doesn’t earn you a major league job. What’s the argument for Hammer over Arano? Seems like they have the same ceiling but Hammer hasn’t hit AA yet. I know he’s got an 80-grade name/glasses combo, but still. I voted for Mills again. Did you see Arano’s numbers at Reading? @murray – Arano’s REA performance is not reflective of his true abilities. Arano suffered an arm injury before the season starts that sideline him until June. The control and the swing and miss ability only started to come back late in the season, thus, the success in his brief stint with the Phillies even though the FB velo is not yet 100%. Except for Seranthony’s transition to the pen, Arano is the top and most MLB ready RP prospect right now. What am I missing on Hammer? Not asking that to be snarky, I’m just curious why folks are so high on him. The numbers don’t seem great. He doesn’t seem to have a high pedigree, as far as drafting/bonus. Does he have electric stuff? I would have Tavares and Arano ahead of him–these guys will probably contribute in the bigs this year. And I might even have Mezquita, who put up good numbers in his limited time and who the Phillies clearly like a lot. …there does seem to be an upside that has only been shown these last 18 months with him, and the Phillies scouts must have seen that when he was in the Rockie org. Thanks! I didn’t know all that backstory about him taking up pitching only in junior college. Still, I think Handzus makes a good point: since he and Arano both seem to profile as late-inning relievers, why not choose the one who is closer to the bigs? Anyway, I’m surprised to see the high quality prospects we have left here. In years past, these guys would have been way higher on our lists. That’s encouraging. Yes agree. The prospect list is definetly deeper than i have ever seen in the past. And I always liked Arano also. Arano will be there in Philly this year….Hammer maybe not unless injuries incapacitate the bullpen….possibly 2019 for him. I’m neither a scout nor a sabrematrician, but as a fan, I can tell you the couple of times i saw Hammer pitch last summer he was lights out with dominating stuff, so he’s got my vote here. I have Hammer time down at #40. Most fans have the “what have you done lately” mentality and Hammer benefited with a strong 2017 and jump in FB velocity considering that pen arms don’t normally rank high in prospect rankings unless they have 2 plus pitches. Hammer can still lose control so I’m not sure if his FB is a plus because his SL is definitely a working in progress. Stuff wise, Arano and Edgar Garcia are better prospects with projected plus FB-SL combo. Connor Seabold, a polished college SP who might follow the Irvin and Esheman way is also a better pitching prospect than Hammer. I don’t know about that. The results recently and scouting reports are pretty impressive. Arano might be better, but perhaps not. Not that sold on Garcia yet. Given how important high leverage relievers have become and that this guy has a chance to be one – ranking him around 30 is entirely justified in my view. I don’t have Hammer in my top 30 but I think he’s a solid reliever prospect. I also think that if his name was Greg Smith and he had perfect vision, he wouldn’t be getting so many votes here. both Arano and Edgar Garcia are projected as high leverage pen arms too. not sure what scouting reports that you are looking, but most common of what i read about Hammer is that his FB velo went up but his SL is need some work – the statistical result is the one that’s only impressive about Hammer so far. Edgar Garcia’s results belie his abilities that’s why people are sleeping on him. Despite fact of the results and a 6’1″ frame, do you wonder why the Phillies keep on pushing him to start when they have a glut of pitchers who can do it? Apparently, the Phillies see something in Edgar Garcia that most fans don’t want to look. I understand that Hammer is close to be to contribute to the Phillies right now, but when it comes to most prospect ranking, proximity doesn’t play significantly. I see Hammer as just outside our top 30, likely #30 without the strange votes which just came out of the blue once or twice. He has the high K-rate and zero HR in 58 IP. That’s impressive. High-A at age 22 is all you can ask of a college draftee. Mezquita for me, again. He’s got projectability, a live arm and command at a young age. went with Simon Muzziotti based mainly on scouting reports and the team paying him $750k and moving him to Clearwater at the end of 2017 as an 18 year old. Tells me they think he can handle the move mentally.. I have Guzman, Gonzalez and Muzziotti as the next 3 top prospects and round up the Top 30 although I know that I’m again in the minority. Guzman is JPC-type SS – plus defense with good plate discipline and Gonzalez is a plus defensive 2B with sneaky power at both sides of the plate. Muzziotti profiles like Tocci – good defensive CF and plus runner but with little power. Looks like Muzziotti can develop some more pop in his bat which might make him a better prospect than Tocci was. I agree that Muzziotti’s floor is probably Tocci. I haven’t seen him other than in pictures but hope he can do the one thing that Tocci seemingly couldn’t… Add weight.. Both in size and bat -side. He needs to pick it up a bit with that comp however, but will like to see how he does this season, without the injuries interrupting his play. I went Gonzalez because of the upside. How great is it to see a system with so much depth?!?! i abstain. Guzman is the next top prospect but his name is not in the list. No, anyone in the system invited to camp (majors or minors) including non roster guys invited to camp.